More valuable, this iPhone 4 ePub Transfer also provides you another useful function: export ePub files from iPhone 4 to computer for you to backup or sharing, which preserves the original quality. The ePub files that you can export include iTunes eBooks and Custom eBooks. The ?Search? 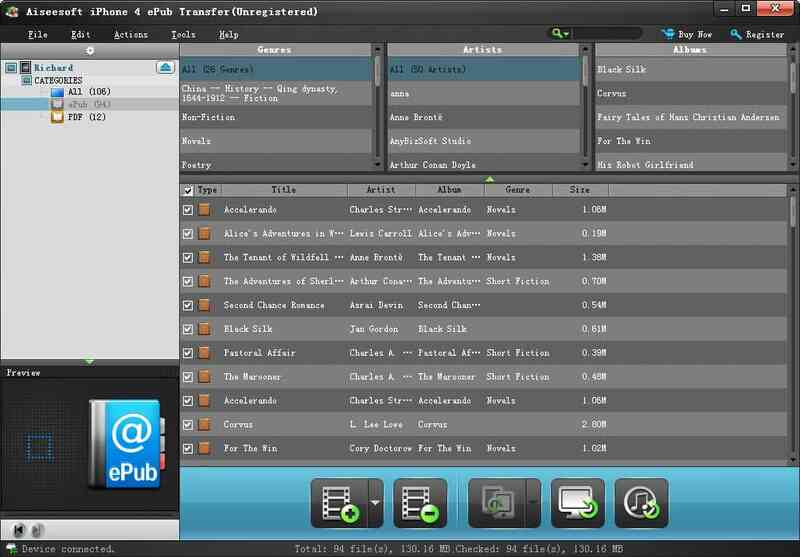 function is available for you to quick find your desired files by Genre, Album and Artist. You can directly transfer ePub files to iPhone 4 without iTunes. You can also export your selected ePub files (iTunes ePub and Custom ePub) from your iPhone 4 to computer directly. This ePub to iPhone 4 Transfer can help you enjoy ePub on iPad, iPhone 4 , iPod touch. You can easily detect your desired ePub file under the help of the ?search? function by the category of Genre, Artist and Album. Convert any video/audio to Mobile Phone. Transfer iPad files to computer. The best iPod files Manager.